Does anyone know much about building in steel? There's a lot of it going on, I'm guessing the labour cost hike and low steel price is making it more affordable than concrete. It also seems a lot easier than pouring columns and all the hassle involved. You just need a decent welder. In Australia they send plans to China, where all the steel is cut, with bolt holes added. Then they just bolt it together. I wonder if a Thai steel yard may be willing to cut the steel? Then it just needs to welded on site. This would prevent those costly mistakes that we all know and love. No indication of what type of building you are considering building. That would alter the costs. 4. you will find a steel fabricator who will produce the parts as per the drawings. If you have all that it's down to cost of purchase, plus then costs of maintenance over a given time period. Do the maths and the answer is there. There will be structural engineers in Thailand who would gladly take on all the above roles as are available in most countries worldwide. For any other structure I suggest the qualified Thai Engineer is the only route. it costs the same price or more, but less Somchai can do it, so notvrecommended maybe ? and i don't know amout maintenance ? Thanks for the replies. It's a house I'm considering, but with a very open design. Oh Oh, I would also need to find similar ppl if building in other materials. I know a little about steel and welding, but almost nothing about concrete. I'm wary of the expert local concreters, as I've seen enough go wrong. I would feel more confident with steel. I think it would be easier to find a couple of good welders, than reliable team to do the formwork. My experience with Thai builders hasn't been great. There not crazy about me and my insistence of using plans and double checking (especially when it's proved necessary). I figure it would make it easier to do the job in stages, mean less workers, so easier to control what's going on. I would get it prefabed to a western design and make sure isolation joints are in place to stop any noise travelling through the structure. Have you considered shipping containers? Other than landscaping my project is near complete. There are some drawbacks such as heat, but insulated properly and in the right location they are an affordable and customisable option. Ours is set amongst and under trees so we hope it will stay quite cool. Have you considered shipping containers? I had considered them sometime ago, was quoted B45k for secondhand and B80k for new, or something like that. The steel price is low now, I think it would be better to buy new steel, make a frame, then put colorbond for the walls (if you wanted to stick with metal). A builder who was working on them told me what a great idea they were, when I asked how they compared to the price of new steel, you could tell he'd never even considered it. This is one of the things I'm wary of with Thai builders, dodgy advice or 'up to you', only to be told one the jobs done that another way would of been better. We are having some work done now, when the guy runs out of material I have to drop everything and get it for him, otherwise he's got nothing to do. I'm working and try to plan my days, so it's a nightmare. You could make a really great looking house that's a bit different. I'd like to use steel for columns and horizontal members, with bamboo for bracing. I think it could look nice, be affordable and suit the climate. There is an architect designed place near us, it looks great, very open. They've used a lot of zincalume, including vents etc. that are normally for industrial use. This is reasonably priced, durable and can be order to size by giving the factory plans. Much easier than running round doubling checking. I'm not sure that 'usually' is correct for general usage. I have been thinking about this a lot. There seems to be a push on steel, but its mostly light steel box or galvanised steel (cold rolled). The heavier I/h beam construction is more like a commercial building and maybe this would be the best way to go about thinking of steel construction here. Normally welding even on bigger projects is not amazing and it would be better to get welded bolt connections where there is less welding and more emphasis on bolted joints. This also suits building onsite. I agree I have doubts about the ageing of the light steel one sees in residential buildings. Bolted connections can also be welded to the beams in the shop, this should lead to higher quality welds. A few slotted holes would allow for on-site adjustments. Also quicker erection, always a good thing in my book. Prefabis very popular here, possibly due to the lack of skilled labour. Even basics like planning reading and proper understanding of the metric system. A little complex for your average Thai builder methinks. 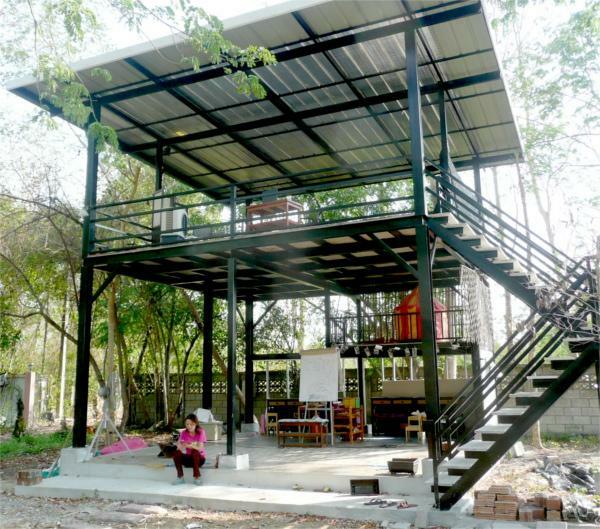 A Russian company is selling dome house at Kanchanaburi. Horse hide covering or glass? Tough on the kitchen designers I believe. Everything we've built is steel because we live in termite country and we find cement structures really fiddly - useful for walls and floors, but not for the main structure. It's not necessarily cheaper, but I think it's more reliable and easier to build. For structural support, you should usually go with H-beam or I-beam (which aren't cheap, but you only need these for the supporting columns and beams). The rest can be built with box-beams. Oh, there is not a wide range of sizes available in Thailand and it has its own standard, so it's best to get a local (Thai) engineer to do the calculations. As another poster said, you definitely need someone with proper experience welding steel constructions. Thais tend not to use bolts as connectors, they simply join two beams together. So your entire construction depends on the strength and permanence of these welds! Also make sure to seal all beams with primer and then paint with a second coat of paint. The beams you buy are not coated or galvanized. Steel rusts incredibly quickly in Thailand. If you don't do this properly your structure could collapse when the rust eats sufficiently into a supporting column or beam, maybe after 10 years or so. Keep in mind that steel bends! And it expands and contracts (a lot!) as the weather changes. Despite taking this into account when laying down the tiles, several of the them are already cracked because of the force of the frame stretching and contracting. BTW, we considered containers also, but they're just too narrow (2.5m wide) and the modification costs turned out to be more than just building with steel from scratch (with no constraints on design). Last edited by rapidll; 31-07-2016 at 01:40 PM. Hi Rapidll,...the house structure looks good, certainly better than using concrete in some areas.."Steel is Real"
I would imagine using shipping containers, sometimes the cost is more than you could build..good for storage, but to me, not so good to live in.. The link above is very interesting. You can build with Hollow structual Steel (HSS) or as other countries call it by shape (RHS) (CHS) (SHS) for rectangle, circle and square box sections. There is even a method of filling the box section post with concrete to improve structual support and also fire protection something very important in steel framed building. The other consideration is insulation for noise, condensation and heat transfer. The best method is to use 1-2" thick XPS foam on the outside although im finding it very hard to track down in Chiangmai. Mght have found a place in BKK. I would say that bolted connections would be better than welds, what would be better as mentioned before is to get a fabricator to weld the bolt plates to the metal. In here they talk about lindapter connections similar to those used in concrete. This pdf is a good read. and I hope someone has some more info soon. I would say in that metal building above, the height of the h beam connecting to the cross beam holding the joists (if wobbling) might have meant going for the next size up because it seems high. Also the cross beam h section probably would have been also better to go for the bigger flange type. But the main thing is you could always add connecting plates to bolt through and improve the structure. maybe even a haunch welded or bolted somehow to the posts might improve the wobble? Im not an expert as you can tell. Something like this as a frame would be good, you can then use wood joists i beams joists to make the floor, failing that for fear of termites either precast concrete or metal joists and viva board.